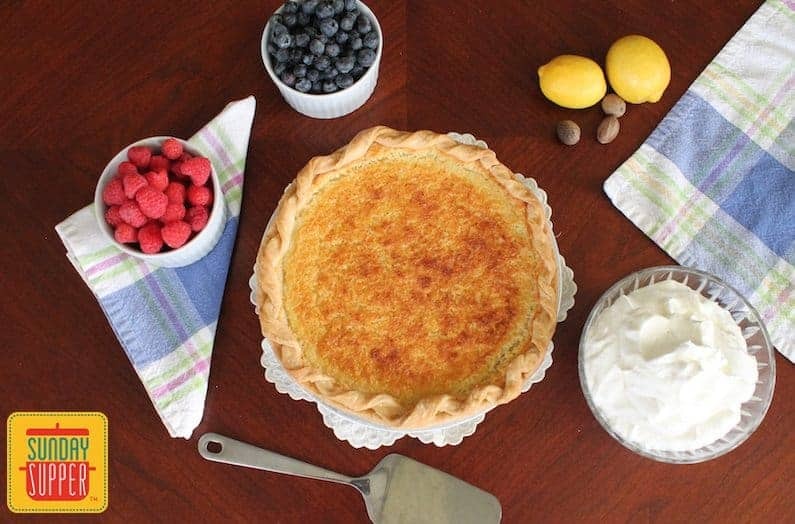 Southern Buttermilk Pie is a classic dessert made with thick buttermilk, eggs and a hint of lemon. It bakes up with a sticky golden top that will have you cutting just another slice till it’s all gone. Top it with whipped cream and fruit or eat it as is. 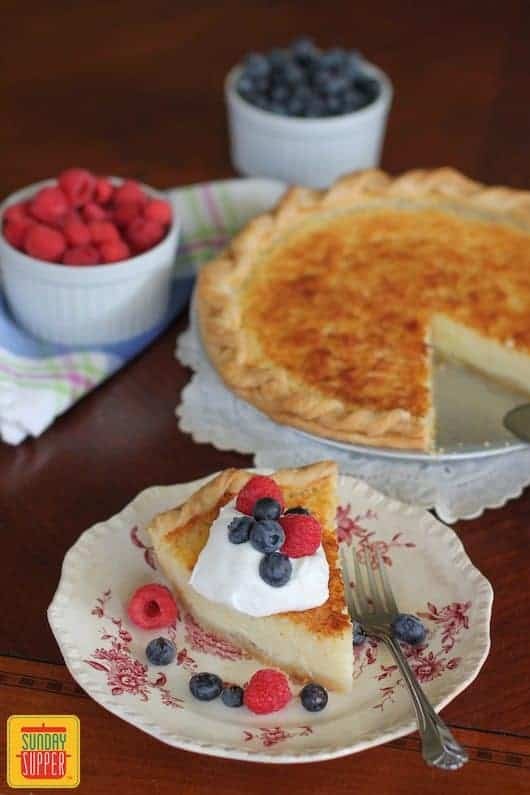 Southern Buttermilk Pie is perfect either way. When I was young, many vacations and every long holiday weekend meant a five-hour drive from Houston to the small town in Louisiana where I was born and my parents were raised. New Iberia was known worldwide as the home of Tabasco but to me it meant time with extended family, great home cooking and lots of time outdoors. At least once a trip we’d load up the car and head out to the dairy farm where my grandfather grew up. Those jaunts were known as “going to the country.” As an adult, I asked my mom how far “the country” was. Turns out it was only about four miles. Isn’t it funny how our perceptions as children can differ so greatly from reality? Bumping along over the dusty back roads and cattle guards, it seemed much farther. The dairy farm was run by my grandfather’s younger brother, my Uncle Floyd and his sons. His wife, my Aunt Ruby always had something freshly baked to share when we’d visit. There were horses we could ride and trees to climb but one of the best parts of the day was afternoon milking. With some sort of instinctual internal clock, the cows would start to head back from whatever green pasture they had been grazing in, tails flicking the flies as they found their way into the stalls. The milking contraptions were gently attached to the cows’ teats, one by one, and then a terrific noise deafened us as the pumps were turned on. It seemed a miracle of modern science to see the white creamy milk flow through the hoses. The cows chewed contentedly on straw from bins right in front their faces throughout. June is National Dairy Month so Sunday Supper is pleased to join Florida Dairy Farmers to kick off the celebration. Florida Dairy Farmers is a farmer-funded organization representing more than 130 Florida dairy farms that works to promote increased milk and dairy product sales statewide. They even have an educational outreach program. 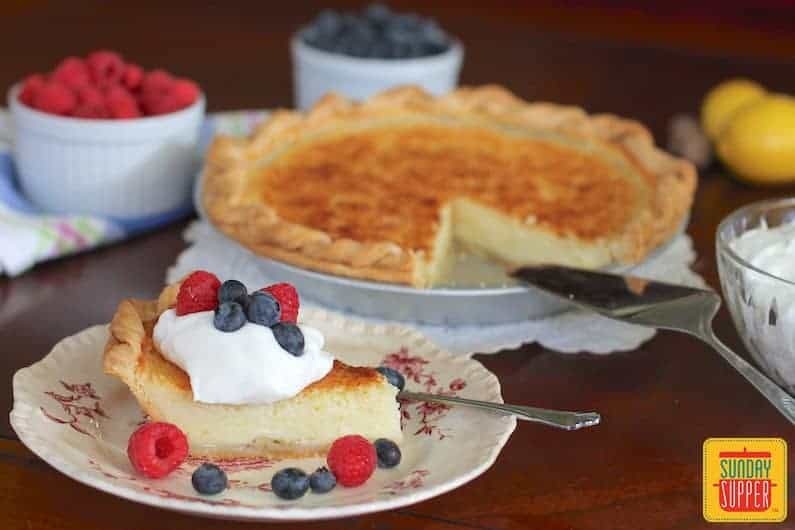 In addition to the wonderful dairy rich recipes we are sharing today, you can find many more on the Florida Milk website. When a person talks or writes about buttermilk pie, maybe saying Southern Buttermilk Pie is superfluous. 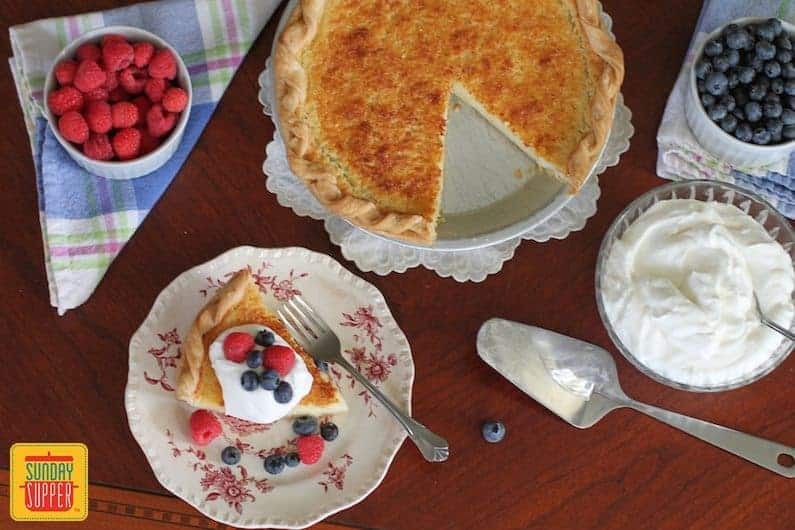 Do northerners even make buttermilk pie? I’d love to hear from you if they do! 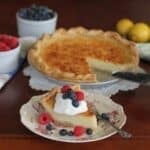 Southern Buttermilk Pie is a classic dessert made with thick buttermilk, eggs and just a hint of lemon. In a large mixing bowl, combine the sugar and butter and beat until fluffy. Add the eggs in one at a time, beating well in between. Beat in flour, lemon zest and vanilla. Stir in the buttermilk with the beaters on very low. Pour the buttermilk mixture into the pie shell. Grate on a little nutmeg or sprinkle on powdered nutmeg very lightly. Bake until the top is lightly browned and the center is just starting to set, about 40-45 minutes. It should be just the slightest bit jiggly. It'll set up more firmly when it cools. Slice the pie into individual servings. Garnish with the whipped cream and fruit or eat it plain. *I used Bulgarian buttermilk. Think Greek yogurt vs. regular yogurt. That's how Bulgarian buttermilk compares to regular buttermilk. Check out all the wonderful dairy recipes we are sharing for #JuneDairyMonth! Join the #SundaySupper conversation on Twitter every Sunday! We tweet throughout the day and share recipes from all over the world. Our weekly chat starts at 7:00 pm ET. Follow the #SundaySupper hashtag and remember to include it in your tweets to join in the chat. To get more great Sunday Supper Recipes, visit our website or check out our Pinterest board. This post is sponsored by Florida Dairy Farmers in conjunction with a social media campaign through Sunday Supper LLC. All opinions are those of the individual bloggers. I happened upon this recipe when I accidentally bought Bulgarian buttermilk. 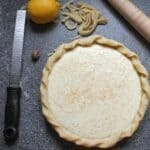 I have never added lemon to my buttermilk pie before. I used the zest of one whole lemon. I also added a teaspoon of vanilla and I only used a half cup of sugar and a half stick of butter. It was still plenty sweet, very lemony-good and the pie came out perfectly. Very good recipe.